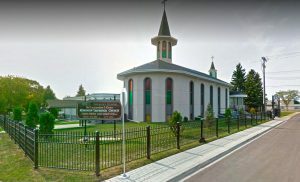 On May 24, 1948 a few of us “Edmonton Romanians” gathered together to celebrate Mrs. Elena Fieca’s Patron Saint’s Day – Sts. Constantine and Elena. An idea was put forth to get Stefhan Fieca to become our Parish Priest, following in his father’s footsteps (Revering Fr. Dumetro Fieca). Stefan’s Mother’s fervent wish was for him to enter the priesthood, so with his wife’s and all our coaxing, we won him over – he agreed! We had planned a big feast after his first service, but alas, it was not to be. Instead, he had to perform at his own Mother’s funeral. She had watched the clock all morning, so at 11:00 a.m. she said, “Now he is in front of the Holy Altar taking his vows.” It was precisely at that time, Father Fieca confirmed later, that she silently passed away. Her wish had been fulfilled. Services were held at various places – people’s homes, the Jubilee Auditorium, even at Park Memorial, where they were kind enough to loan us their premises; then to the Anglican Church in Riverdale. Father Fieca served us and our Mather Church of St. Mary’s at Boian until left us to go to Akron, Ohio in 1956. In the ensuing years we had visiting priest: Father Toustiuk served us and Boian for a few years – his first Service in our Romanian Center Hall was in 1996. In took some time to find the land. Several trips to City Hall to confer with Mr. Armstrong of the Land Department for a suitable site, then on to Mr. Roger’s in Town Planning to re – zone it for a Church. I was then able to take the plan to the Board for approval. They did and the deal was made. Arranging the mortgage was our next step, at Edmonton Savings Credit Union. The mortgage was paid off in 1968. Phase I was the Romanian Center (Hall), which gave us revenue. We were proud owners of property at 9005 – 132 Avenue in the City of Edmonton. The building contract was awarded to our Romanian contractor, Nick Kachuk. We held many fundraising functions such as bazaars, teas and socials, with catering to follow. To this day, our Ladies Auxiliary is still rolling many a cabbage roll, and making our famous cheese dumplings. We starting bingos at “Troc 59” in 1958, then moved into our own Centre in 1965. Bingos and lotteries were our prime source of income, plus private donations. Mary Romanko ran the bingos in both places for twenty years and lotteries for 15 and one – half years. Nettie Hutseal was a great help. Hall Managers were Nick and Mary Romanko from 1965 – 1968; Ed Ostapiuk 1968 – 1969; Alex Russ 1969 – 1970 and many more since. On May 4, 1965 we had our first party in the new Romanian Center, but we had to dance on a cement floor! The first wedding was on August 14, 1965; the first Baptism was in April 14, 1967. Our first bingo in the Center was held Ocober 4, 1965. We hosted the Romanian Ballet on tours in 1966 and 1968, performing at the Jubilee Auditorium. We heard that nowhere in Canada were they so warmly welcomed. An enthusiastic “turning of the sod” took place on a cool, misty day, March 14, 1971. The Church was built and consecrated on May 22, 1972. Feather Panciuk served us for 19 years. We carried on with religious and cultural activities: Romanian Folk Dance groups included the Fluturasi Dancers, Miorita and Balada; Sunday School and Church summer camps for children; choir and caroling; a tent at the Heritage Festival and a sponsored the Youth Group and the Dance Group with Bingo funds. In 1977 for a film on “Memories of Our Culture,” we participated on a television program, “The Village Square”. We performed again in 1979 and 1980 on CFRN – TV; our Choir sang, dancers performed, we had a fashion show and displayed Romanian artifacts. We also went on radio programs and made some tapes. Musicologist Valeriu Apan helped us on many of these productions. Father Gheorghe Brazgan has been serving our parish for the last 15 years. He teaches the church choir new songs and has started the men’s choir, which sings exceptionally well. He is working very hard and the people are staying faithful. With The Grace of God to give us good health and the strength, may we carry on for generation to come!